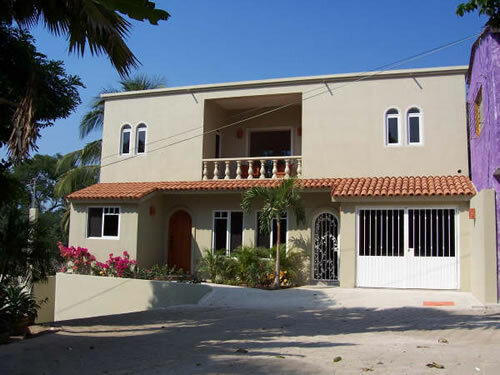 Located just 3 minutes from the beach and down town La Manzanilla. Two bedroom, two bath home with one bedroom rental apartment downstairs with street-level separate entrance. From left to right are the windows facing the stairs and back patio. There is an outside door to the back patio then an inside door into the bedroom. Just before entering the bedroom door is a small 'nook' with internet/telephone hookup where you can set up an office, computer etc. On the right are the doors which lead to the front patio. The contents of this site are copyright © 2008, Daniel Hallas. All rights reserved.